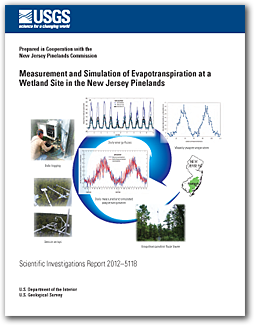 Evapotranspiration (ET) was monitored above a wetland forest canopy dominated by pitch-pine in the New Jersey Pinelands during November 10, 2004–February 20, 2007, using an eddy-covariance method. Twelve-month ET totals ranged from 786 to 821 millimeters (mm). Minimum and maximum ET rates occurred during December–February and in July, respectively. Relations between ET and several environmental variables (incoming solar radiation, air temperature, relative humidity, soil moisture, and net radiation) were explored. Net radiation (r = 0.72) and air temperature (r = 0.73) were the dominant explanatory variables for daily ET. Air temperature was the dominant control on evaporative fraction with relatively more radiant energy used for ET at higher temperatures. Soil moisture was shown to limit ET during extended dry periods. With volumetric soil moisture below a threshold of about 0.15, the evaporative fraction decreased until rain ended the dry period, and the evaporative fraction sharply recovered. A modified Hargreaves ET model, requiring only easily obtainable daily temperature data, was shown to be effective at simulating measured ET values and has the potential for estimating historical or real-time ET at the wetland site. The average annual ET measured at the wetland site during 2005–06 (801 mm/yr) is about 32 percent higher than previously reported ET for three nearby upland sites during 2005–09. Periodic disturbance by fire and insect defoliation at the upland sites reduced ET. When only undisturbed periods were considered, the wetland ET was 17 percent higher than the undisturbed upland ET. Interannual variability in wetlands ET may be lower than that of uplands ET because the upland stands are more susceptible to periodic drought conditions, disturbance by fire, and insect defoliation. Precipitation during the study period at the nearby Indian Mills weather station was slightly higher than the long-term (1902–2011) annual mean of 1,173 millimeters (mm), with 1,325 and 1,396 mm of precipitation in 2005 and 2006, respectively. Sumner, D.M., Nicholson, R.S., and Clark, K.L., 2012, Measurement and simulation of evapotranspiration at a wetland site in the New Jersey Pinelands: U.S. Geological Survey Scientific Investigations Report 2012–5118, 30 p.